Building a New Day Center! Family Promise of St Tammany is honored to be part of the Safe Haven Campus development and has been provided land to build a new Day Center. Safe Haven is a collaborative healing environment for the behavioral health continuum by creating a high-quality, coordinated, sustainable and humane network of care anchored in St. Tammany Parish. Safe Haven will serve as a comprehensive multi-faceted program and a "single point of entry" into the behavioral health continuum of care for law enforcement, the judiciary and local area hospitals. We are so excited about this opportunity to be a part in the development of such a dynamic and innovative hub of services for our community. The new Day Center will provide a parish-central location for our families to work on breaking the cycle of poverty, obtaining critical life skills, and gaining the connections and necessary support to maintain housing long term and self sustainability. The children in our care will be able to stay within their school of origin. This will be obtained through a close working partnership with the St. Tammany Parish Public Schools. The new Day Center will not only provide a place of safety and comfort for those in need, but also act as a hub of operations for volunteers and staff as we offer the hand up to our clients. The new Day Center will also offer an opportunity for an increase in capacity and expansion of our services. 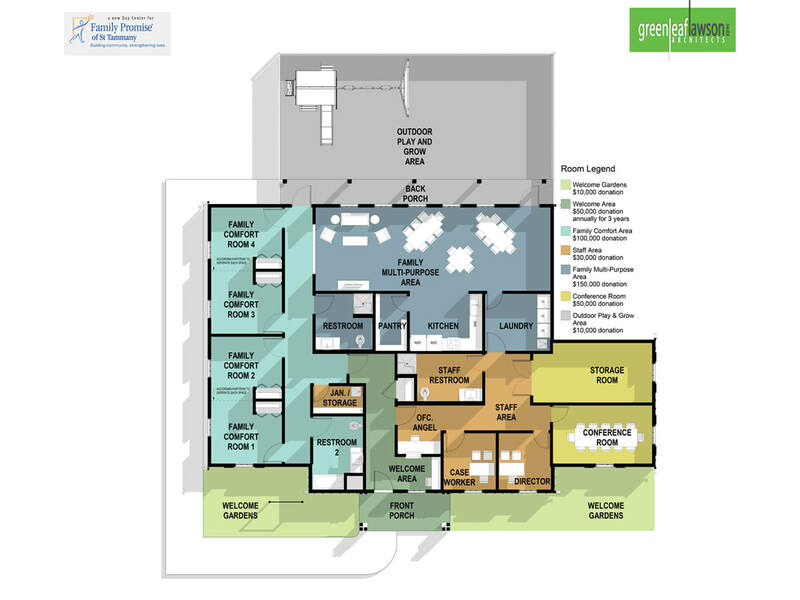 We ask you for your support to build the new Family Promise of St Tammany Day Center. Your investment in the Day Center is not just an investment in a building, but an investment in the future of homeless children and their families. Thank you in advance for your generosity and for helping to empower homeless children and their families to succeed in finding forever homes. CLICK either of the (2) images to see an expanded view of the Day Center building plans or an artists rendering of the exterior view. *CLICK the BLUE button above to view the PDF File. A description of each area of the Day Center, it's specific function; and the donated amounts necessary to fund / sponsor that area. And finally a PROJECT TIMELINE (in four phases) to plan, fund, and construct the new Day Center. The donated amounts we have received to-date. And finally, any updated news regarding any aspect of the project.